Benaki Museum - “Art In Intensive Care”: Watch it and Vote for it! “Art In Intensive Care”: Watch it and Vote for it! The Benaki Museum participates in the International Contest “Museum in Short” is open to all the different forms of videos produced by museums. 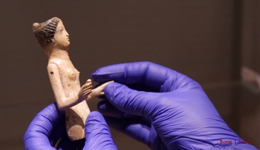 The Benaki Museum Conservation Department created the film "Art in Intensive Care".